That will give you pause for sure! I need to make an elk target myself. I have to admit, I was about as excited as I can remember to see a package delivered because I was ready to have it!! I understand, it's tough to lay off. I broke my collar bone about 7 years ago and it took everything I had to lay off shooting. I even tried shooting left handed! Trip is scheduled for September so about 4 1/2 months to go! That target is really cool. I built a projector target a few years ago so I could shoot at a variety of elk targets. I like it because I can basically make a target out of any picture I can find on the web. The main drawback is I have to shoot at night as my projector is not bright enough for daylight viewing. Blue Bluedevil that is pretty cool. Looked up those bales and a company in Arlington sells them. I'm going to check on availability and price. I remember seeing this a couple years back! That is a super cool idea for sure! Your wife was thrilled ! I bet she was like get the buffalo out of the living room pronto! That’s funny I know the feeling when I fletch arrows on the kitchen table. Buffalo medicine arrived in the mail. 300grain Tuffhead hopefully will do the trick! That's the same head I used for a big piggy the other day. Edit: A foot of penetration after going through 3/8"-1/2" thick shield and doornail dead within 150 yards on a 238-lb boar. Ellis, I was thinking that it was the same head you had used. Hopefully I will have the same outcome with a buff! Anxious to see how the setup works on the barrel test once I get it all put together. As soon as the Texas Longbow Championships is over next weekend, I'm kicking into full gear with my buff bow and will try shooting only it (aside from a couple tournaments) until my hunt. I also purchased a few of there "practice" heads so I can shoot them a lot and not have to worry about sharpening or wearing the edges out on my hunting heads. In other news, I purchased my plane tickets today too! fixing to start the downhill slide of this thing!! Just put it between two ribs and you will be golden!!!! It ripped two ribs on Ellis' pig. I know they aren't as big and tough as those feral bulls running around Africa but then again we always just use a .22 to kill the steers for butchering. There is no comparison between the biggest pig rib and a Cape buffalo rib!!!! I'm pretty sure those heads will do the job. VERY nice head. I am hopeful to see that thing poking out the off side of a LARGE Buff. 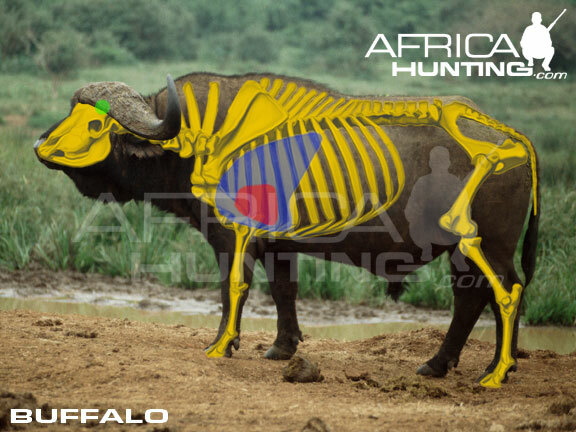 Since I have exactly 0 experience with Africa, what is your projected range on said Cape Buffalo with traditional equipment, and just curious... Does your PH back you up with some large bore rifle? 45-120 express?? 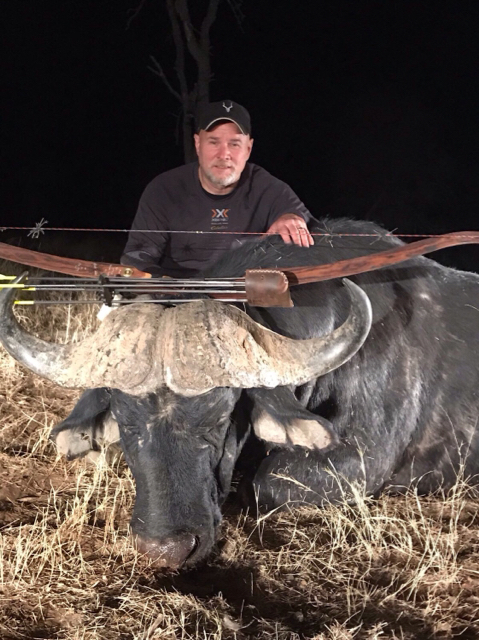 If I remember correctly, Buff shot his cape buffalo at under 20yds. I was on the hunt when TexasKing shot his at 22yds. A inside look at a buffs chest cavity.. For reference.. I hope and pray I'm lucky enough to get it between ribs, but I know my chances of that are slim with the way those critters are made. If I can pull off the same shot as Tim did putting one right in the pocket, then I'll be golden!! Thanks sir! Really hoping I can see my arrow sticking out the opposite side of his rib cage when it all happens! Hoping to keep things in the 15 to 20 yard range, but we shall see how it all pans out. Lammie (my PH) will carry are rather large caliber rifle in hand in case the worst happens and take care of it from there. I truly hope that it does not come to that as I don't want projectiles other than my arrow being shot at him, but if it has to happen then so be it. Thanks sir! I've looked those pictures over a lot along with every other image I've found available that depicts the vitals on a buff. That inner cavity pic still makes me shake my head every time I see it! I've seen a picture somewhere of a full cape buffalo skeleton intact at a museum and it is pretty amazing to see how the are built. Still can't believe how the ribs are so close together. Good luck sir! Nothing more exciting than hunting black death with a bow. I took mine last year. I used a compound tho.....so, I admire what you're doing! Regardless of weapon, that's awesome! I have wanted to hunt buffalo for as long as I can remember, but especially since I ready Peter Capstick's "Death in the Long Grass". I have NEVER been a big reader, even when I was younger, and that was the very first book (one of still only a handful) I read from front to back cover completely and have been beyond intrigued ever since. I was finally able to come across the picture of the complete skeleton I'd seen. I know its the same skeleton, but the photo isn't quite as good as the one I had in mind but still gives a good idea. Sure looks like no matter what, you are connecting some massive rib bones. Not much way between those, even if you are a great "finesse" shooter. Again, no history with said animal, but I can't help but think you are more than ample in equipment and gear. Best to you, and looking forward the the remainder of the journey. 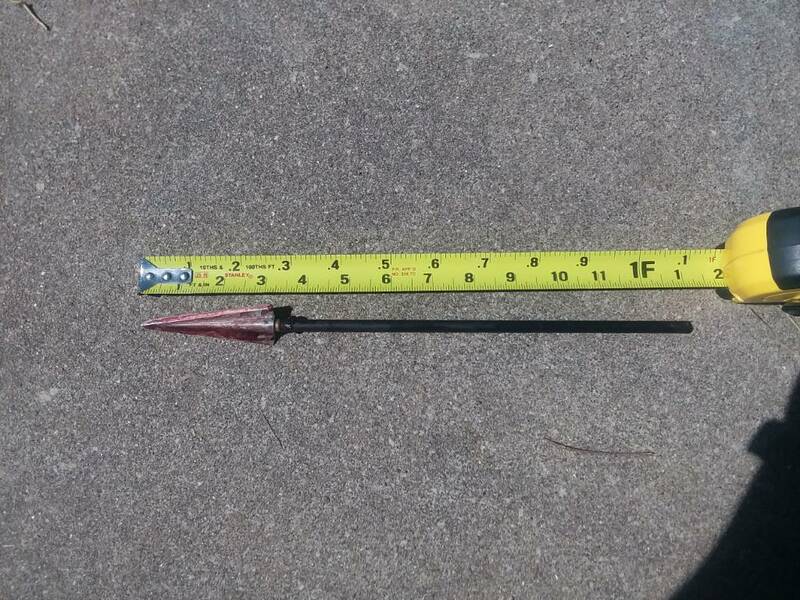 The arrow in this buffalo was off a 72# Recurve, and never touched a rib going in. It died 100yds from where it was shot! Use a Rage and watch it drop. It was quartered away. I have the video of the shot, but can’t post it. It was awesome!!! One of the coolest things I’ve ever witnessed done with a trad bow! Pictures don’t do them justice as far as showing how big they are. You should have seen the front end loader they used to pick it up!!!!! Last edited by Bisch; 05-17-2018 at 10:50 PM. Figure out a way to post that video!!! The odds of getting an arrow in one of these critters and NOT hitting a rib going in are very low. If they are quartered away a touch with the front leg forward, it does open up an area about the size of a cantaloupe that would allow arrow entry in without hitting a rib, but puts you at risk of hitting the shoulder bone. Did you get the titanium adaptors for you tuffheads? That right there is plane crazy!!!!! I did not get the titanium adapters just yet. I bought the new preassembled heads they started selling to make sure they flew good, then planned on getting the titanium inserts and new heads at that point. Definitely agree on the cheap insurance part, especially seeing that rib bone with a broadhead sticking out of it! Shiloh...Are you drawing on the 76lber yet? Also, have you considered working out simply drawing an 80# (plus) bow on both...left and right handed (to balance and develop both sides of your body)...sides to make drawing lesser weight easier? Not shooting...just repetitive drawing...going to fatigue or structured sets. Serious Rib bone and thanks for the action shots. Pretty awesome what can be done with a bent stick.. Of sorts. No sir still not shooting 76, but have been working on drawing and holding with it, and also changing up and adding in some new workouts at the gym to help increase back muscle strength that hopefully will replicate holding heavy weight at full draw. If I had a heavier bow, just drawing and holding would definitely be of help I'm sure. I did get another riser for my 67lb limbs so I basically have two separate bows now and wont have to worry about swapping limbs back and forth. Going off Buff's insight, I'll be able to shoot my light bow, then throw in a few shots here and there with the 76lber. Now that the main tournament I had on the schedule for the year is out of the way, pretty much all of my time will be devoted to getting this thing up and going! Me too sir! 87 days and counting!! Fantastic! Im glad to hear you got that second riser. Easy way to simulate heavier draw-weight is to use some surgical tubing in conjunction with drawing a lighter bow. Hold one end wrapped around the grip and hold the other end with the draw hand. Just draw the string while holding the added resistance of the tubing. Draw-hold-let down; repeat to fatigue. Can use different colored bands or even double them up to get the desired resistance. Use care to secure them well. Nice thread! Good luck on the prep and hunt! I'm officially on the home stretch of this, sitting 47 days out from take-off. I'm still fine-tuning my setups, but about have them settled out. My light bow I'm shooting Heritage 350s with 50gr brass insert and 175gr heads with a total weight of 635gr and shooting 176fps. I did just receive a few other setups to test out on this bow, but the current setup is shooting well so it will have to really shoot good for me to change up at this point. My heavy setup I'm still not 100% sure on. I've got two different setups, one being widowmaker 250s totaling 835gr and some Easton FMJ dangerous game 250s totaling 910gr, both with 300gr heads. What is crazy and I can't figure out, both setups are shooting the same speed through the chronograph (166-168fps). The only thing I can figure is the widowmaker's have pin nocks and they are really tight on my string, which may be pulling my speed down a bit. Also, they aren't 100% tuned like I'd like them to be (although close) which may take a little off as well. I did play a bit and swap heads out on the FMJ with a 375gr head and was a little star struck to see the weight of 1006gr pop up on the scale! On a side note, I'm still working out 4 to 5 days a week, and I've finally reached a point where it is starting to show. When I started out, my 65lb bow wore me out after a dozen or so shots. Now, I can comfortably shoot it several dozen times before it starts wearing on me. The 76lb set doesn't feel bad either, and its crazy to say but after shooting it a bit, the 65pounder feels light and I never expected to say that!! Hopefully will have everything sorted out in a week or so and have my setups finalized! Can't wait to get back across the pond!